MESTRE CUPIJO E SEU RITMO-SIRIA. Recently, things have been quiet with Samy Ben Rebjeb’s Analog Africa label. Samy is very much a believer in quality rather than quantity. Analog Africa have only released sixteen compilations since 2008. Their sixteenth release, and first of 2014, is SIria, a compilation of fourteen tracks from Mestre Cupijo. 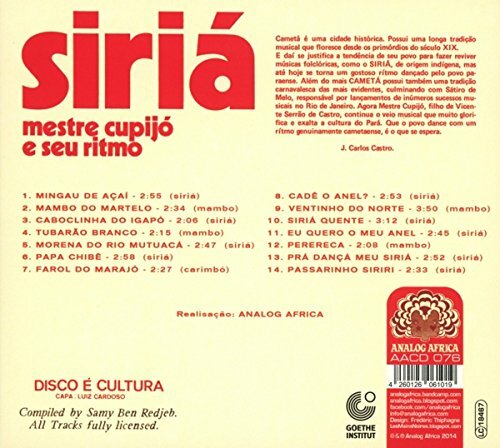 Sirio was released on 30th June 2014, and features fourteen tracks from the six albums Mestre Cupijo recorded between 1973 and 1978. The music on Sirio is a delicious and irresistible melting pot of musical influences and genres. Siria’s origins are the state of Para in Northern Brazil. Siria is a fusion of Brazilian music. This includes the music of the inhabitants of the quilombos. It’s a settlement in rural Brazil. It was originally founded by African slaves, who managed to escape their captors. The other influences is the music of the indigenous people of the Amazon rainforest. From these two very different sources, a pulsating, insistent and organic music was born. It was alive and full of vitality. Later, it was given a musical makeover by a Brazilian musical legend, Mestre Cupijó. Since then, Siria has become the soundtrack to many a party, festival or celebration. That’s thanks to Mestre Cupijó. It was in the state of Para, in Northern Brazil, that Mestre Cupijó was born in 1936. He was born into a musical family. His father was Mestre Vincente Castro, who was the musical director of Eutepe Cametense. This was a band that had been founded by Mestre’s grandfather in 1874. By the time Mestre was born, Eutepe Cametense was the oldest band in Para, and some believed, Brazil. Mestre would become the third generation of his family to become a musician. Aged twelve, Mestre began playing the clarinet. This was the first instrument he learnt to play. Soon, he was able to play guitar, ukelele, piano and violin. A talented multi-instrumentalist, the elders at the church Mestre attended, arranged for him to receive extra musical tuition. This resulted in Mestre learning to play another instrument, the saxophone. It became the instrument that Mestre became known for. By 1959, Mestre was twenty-three and an experienced musicians. He’d played with a number of bands. The next step was to found his own band, the Jazz Orquestra os Azes do Ritmowas. Now Mestre was the third generation of his family to become a bandleader. Despite having his own band, work wasn’t easy to find. So the Jazz Orquestra os Azes do Ritmowas had to be willing to play all types of music. This included the waltz, mambo and bolero. Mestre and his band had to be able to play all the songs that were popular in dance halls and the radio. Other genres of music that interested Mestre were Carimbo and Siria. Carimbo was the music of the Selgado region of Brazil. Siria was the music of the black community of Cameta. This was the music that fascinated Mestre. So much so, that to discover the essence of Siria, Cupijó went to its source. He spent a year living with the quilombolas community of the Amazon. This proved to be a life-changing experience for Cupijó. Revitalised and energised by the experience, Cupijó set himself a goal. He decided to give several traditional forms of Brazilian music a makeover. This included Siriá, Samba de Cacete, Banguê and a variety of other traditional musical genres native to the state of Pará. To do this, Cupijó’s Jazz Orquestra os Azes do Ritmowas was renamed Os Azes do Ritmo. A musical revolution began. This just happened to coincide with an onslaught of music filling Para’s airwaves. The music of the Caribbean and Latin America provided the soundtrack to everyday life in Para. So the the cumbia sound of the legendary Colombian orchestras. Another influence was merengue, which was popular in Cuba, the Dominican Republic and in the Amazon. All these influences were playing an important part in influencing the music of Northern Brazil, especially the mambo. One man especially was influenced and inspired by this eclectic influx of music, Mestre. Mestre combined each and every one of these influences. He fused them what he’d learnt whilst living and studying Siriá in the Quilombos. This fusion of musical genres and influences became popular in the various festivals held across Northern Brazil. His band was often invited to the festivals. Often, their groundbreaking fusion meant that they walked away with the first prize. Before long, this was a regular occurrence. Especially when the glorious rhythms of were combined by the lyrics of poet Alberto Mocbel, who was a friend of Mestre’s. They were a potent partnership who were hugely popular. So much so, that word of mouth was enough to guarantee a large crowd when Mestre’s band played live. They often travelled to festivals on wooden boats. A somewhat perilous method of transport, the band always arrived safely. As soon as they set foot on dry land, the word was out. Word spread about the arrival of Mestre’s band. Soon, stalls were set up, selling food and refreshments. After that, the party began, with Mestre’s band providing the soundtrack. This soundtrack proved to be hugely popular. No wonder. Unlike other bands, Mestre’s never stood still. Mestre made sure of this. He made sure the band’s sound evolved. Later, they started to use electric basses and guitars. This meant when Mestre played at the various festivals, generators were needed. They were brought in before the party could begin. However, despite Mestre’s new sound, Mestre wanted a reminder of the band’s old sound. So, he decided to record an album. Mestre’s band recorded their debut and sophomore albums in 1973. Recording of Mestre Cupijo’s genre-melting sound took place at a club in Cametá, called Favela. The equipment used was very basic. Despite this, an explosive fusion of musical genres was recorded. Cupijó, Mestre’s debut album, was a groundbreaking album. Maybe Cupijó and Mestre’s sophomore album were way ahead of their time. Sadly, the first two albums Mestre and his band recorded weren’t a commercial success. That would change with their third album. Having recorded their third album in studio in Belém, Mestre’s luck was about to change. When they released their third album, Mestre’s band were about to become a phenomena. That was down to two tracks on the album, Caboclinha Do Igapo and Mambo do Martela. Both these tracks feature on Analog Africa’s latest compilation of Mestre Cupijo’s music, Siria. Just like so much of the music on Sirio, these two tracks are an irresistible fusion of traditional Brazilian music. It’s then given a modern makeover by Mestre and his band. These tracks are among the highlights of Sirio. Caboclinha Do Igapo is the new, updated sound of Sirio. Innovative, uplifting and joyous it’s two magical minutes of music. Mambo do Martela is an explosive and irresistible call to dance. Braying horns and a myriad of percussion tease and toy with you. Before long, you can’t help but submit to its charms. That’s what happened when a year later, Mestre released what was his best known son. A year later, Mestre released Mingau de Açai. It surpassed the commercial success of his two previous hits. Since then, it’s the track that’s synonymous with Mestre. So it’s fitting that the glorious and joyous sound of Mingau de Açai opens the newly released compilation Siria. This is one of several track from the 1975 album Siria. They’re a combination of mambos and sirias. The mambos include Tubarao Branco and Ventinho Do Norte. Sirias include Siria Quente, Passarinho Siriri, Eu Quero O Meu Anel and Cadê O Anel. These six tracks are just a glimpse of what’s perceived as the finest album Mestre Cupijó recorded. However, comes a close second. Again, Seu Ritmo-Siriá Siriá sees Mestre Cupijó combine musical genres and give them a musical makeover. The result is some irresistible and infectiously catchy music. It’s music that’s provided the soundtrack to many a party and festival. No wonder. Look at the quality of the sirias Pra Dançar Meu Siria, Then there’s mambos of the quality of Perereca and Mambo Do Martelo. Between 1975 and 1976, Mestre Cupijó was releasing some of the best music of his career. This includes a trio of other tracks that feature on Siria. They’re the sirias Papa Chibe and Morena Do Rio Mutuaca. The other track is the carimbo Farol Do Marajo. These three tracks are a reminder of how Mestre Cupijó reinvented traditional Brazilian music. A musical visionary, he reinvents and rejuvenates the music. In doing so, he breathes new life and meaning into them. That’s not surprising. After all, Mestre Cupijó is a musical visionary. That’s apparent when you listen to Siria, which was released by Analog Africa on 30th June 2014. Siria may be Analog Africa’s first compilation of 2014, but it’s well worth the wait. Rather than release third rate releases on a weekly basis, like some British independent labels do, Analog Africa believe in quality rather than quantity. Siria is only the sixteenth compilation Analog Africa have released since 2008. It’s all killer and no filler. Featuring fourteen tracks from the six albums Mestre Cupijo recorded between 1973 and 1978, it’s a tantalising taste of one of Brazilian music’s kept secrets. Previously, Mestre Cupijó was only known by a few musical connoisseurs. Not any more. The genie is out of the bottle. Thats thanks to Analog Africa. 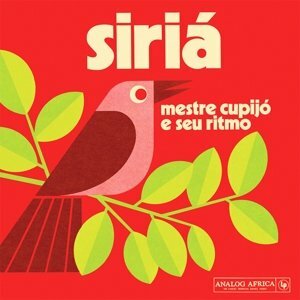 Now the music of Mestre Cupijó can be heard by everyone, on their recently released compilation Siria. ← THE DOORS-WEIRD SCENES INSIDE THE GOLD MINE.